The Department of Physics provides a dynamic and diverse environment for the training of both graduate and undergraduates students. 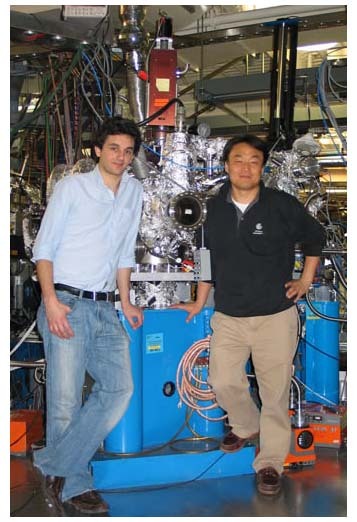 Our three core research areas of condensed matter, high energy physics and cosmology, together with smaller programs in nuclear physics, high energy astrophysics, complexity sciences, and physics education, provide exciting opportunities for motivated students who are interested in cutting-edge research. Our undergraduates go on to top graduate schools and desirable positions in industry. Our graduate students go on to prestigious postdoctoral and faculty positions, become laboratory scientists, or move to excellent industry placements. The vitality of our research programs stems in part from out rapid recent growth; 24 of our 46 faculty have been hired since year 2000. Indeed, our cosmology group, now one of the leading centers in the world for cosmology, has grown in the past seven years from just one member to ten. Students benefit not just from interaction with the teaching and research faculty, but also from the numerous emeritus professors, adjunct faculty, lecturers, research physicists, and postdoctoral physicists within the department. In addition, they enjoy support and friendship from approximately 350 fellow students, including both graduate students and undergraduates majoring in physics and applied physics. Students have access to research facilities on campus and worldwide. Professors and students in our department are highly collaborative across many areas of physics, promoting new avenues for discovery. The department continues to grow in exciting ways. In 2015-2016, we completed searches for faculty as part of an initiative on physics and mathematics of the universe, which resulted in four new faculty in Physics and one in Mathematics. Since 2016 we have added four new faculty in condensed matter experiment and three in cosmology, as well as one in high energy particle physics. Our department's research in these areas addresses some of the most exciting and fundamental questions in science today: What are the most fundamental interactions of matter, and what is the source of mass? What is the nature and origin of the universe and how did it evolve from the Big Bang? What are the properties of complex microscopic systems, in uniquely controlled or novel quantum states? Can we predict how to make novel materials and can we use the spin of the electron to make electronic devices? Our department has traditionally emphasized connections to the development of innovative technology; and indeed, graduates in all of our core disciplines have the materials science expertise, computational skills, and theoretical analysis skills that are much in demand in industry, particularly in Silicon Valley. Recent interdisciplinary initiatives, such as CSC, NEAT, and Universe@UCDavis, as well as the start of the LHC, will further increase the opportunities for physics graduate students to pursue interdisciplinary research. Research expenditures for 2017-18 exceeded $7 million. For more information about opportunities in research, please see Research Areas.